As many of you probably know, when I was the publisher at Malibu Comics, I was a witness to (and a minor player in) the birth of Image Comics. It was a crazy, exciting time. Comics were selling at levels the direct market had never seen. The infamous meetings that the Image founders had at DC Comics and Marvel Comics in December 1991 is the stuff of comic industry legend. 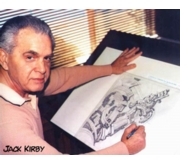 Jack Kirby had very strong opinions about the founding of Image Comics and the steps that the creators had taken to liberate themselves from the work-for-hire system at Marvel and DC Comics. How Jack Kirby fits into this story requires a little background.